Portsmouth’s Isaac Kelly throws a pitch. Valley’s Jared Morrow releases a pitch from the mound. Valley’s Tanner Cunningham steps into his swing. 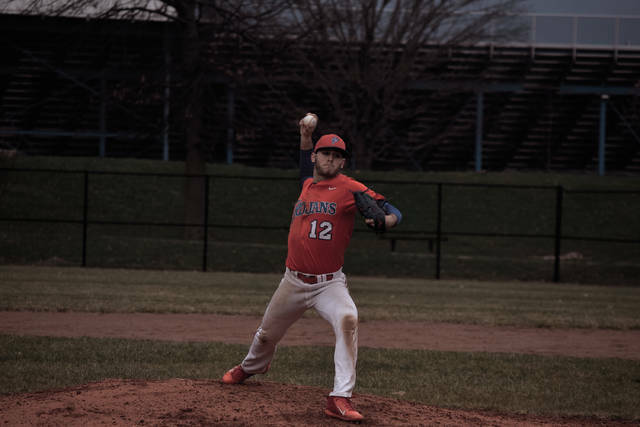 Over his first two seasons as a varsity baseball competitor, Valley’s Jared Morrow has already built up quite the resume. And so far, his third year with the Indians has proven to be no different. The junior hand, after collecting a three-hit performance against Piketon on Monday evening at VA Memorial Stadium in the Indians’ 9-8 loss to the Redstreaks, proceeded to throw a gem of a game against the Portsmouth Trojans’ baseball program on Tuesday evening by striking out seven Portsmouth batters, allowing just seven Trojan hits, and giving up just one earned run. And if that weren’t enough, Morrow also added the game’s biggest hit at the dish by knocking in two runs with his two-RBI base knock in the top of the fifth that allowed Valley to make up an early 2-0 deficit en route to taking home a 5-3 victory over Portsmouth in a nonconference bout that was played on the campus of Portsmouth High School. 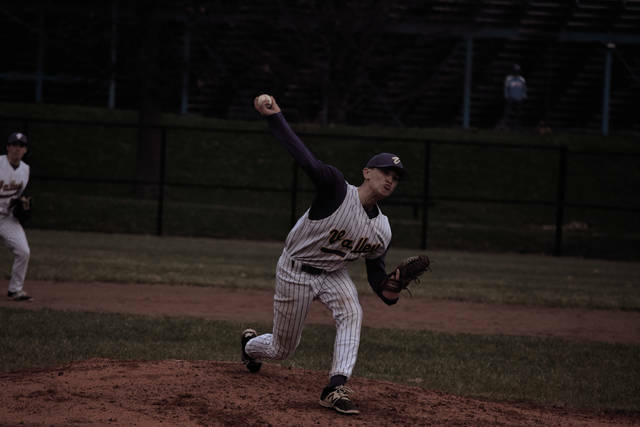 For Nolan Crabtree, the contest came down to his team refusing to quit under the circumstances that beset them early in the contest — when five errors over the game’s first four innings put Valley behind by the previously mentioned 2-0 margin. As for Josh McGraw, the four errors that Portsmouth committed between the fifth and sixth innings were the difference — especially considering that Valley scored all five of its runs in the pair of frames — four of which were of the unearned variety. Early on, however, it was the Trojans who were putting the pressure on the Indians. After a well-hit ball was tracked down in right field by Tanner Cunningham, two consecutive Valley errors — an infield error and a dropped fly ball in the outfield that was tagged in a strong manner by Reese Johnson — allowed Jack Workman to come home for the game’s first run in the opening inning of play. After back-to-back silent frames where Morrow and Portsmouth hand Isaac Kelly combined to face just two batters above the minimum between the second and third innings, the Trojans, again, struck as a leadoff bunt single from Kelly in the fourth inning, along with a sacrifice bunt from Zach Kinney and two infield errors, ultimately allowed Kelly to score as Portsmouth took a 2-0 lead. One thing was for certain, however: Kelly was bringing the heat on the hill, as well. The senior, who — like Morrow — starred on the mound as well as the dish, ultimately struck out four batters, allowed just three hits, and walked only two Valley batsmen while giving up just one earned run through six complete, faced just two Valley batters above the minimum through four innings of work — all while going 3-for-4 at the plate with two runs scored for the Trojans. But in the fifth inning, Valley — seemingly fueled by two pickoffs from Morrow that stymied potentially bigger frames for Portsmouth in the second and third innings — flipped the script. After a routine fly ball to start, a one-out single from Jake Ashkettle and a sacrifice bunt by Andrew Andronis moved Ashkettle over to second base. 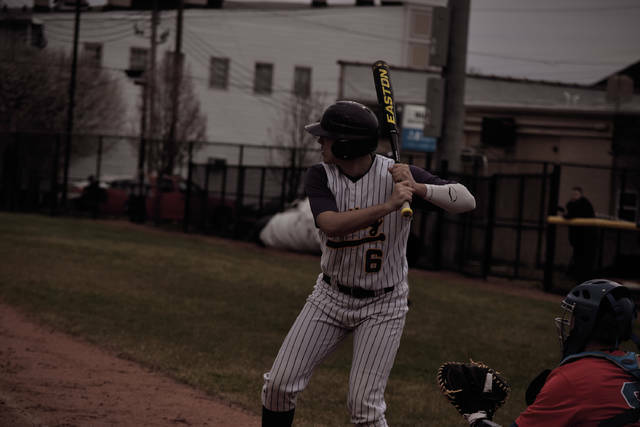 Then, after a Cayton Ruby walk and a wild pitch during Brecken Williams’ at-bat, Cunningham hit a dart that was mishandled in the infield, which allowed Askkettle to score. And from that point on, the momentum certainly was rolling in the direction of the Indians. After a Kayden Mollette free pass, Morrow stepped up from his three-hole position, and — with a chance to help himself — didn’t disappoint by launching a two-out single into right field to score Ruby and Cunningham and give the Indians the lead. Another infield error then allowed Cunningham to score as a four-run frame from Valley allowed the Indians to come from 2-0 down to 4-2 up. Two additional errors in the sixth inning then allowed Ashkettle to score a second time as Valley increased its lead to a 5-2 margin. In the bottom of the sixth inning, however, Portsmouth made things interesting. After a leadoff single from Kelly to start the frame, Zach Kinney walked and William Sturgill shot a single back up the middle to load the bags up. Two batters later, Ethan Boggs responded with an infield single off to the right to score Kelly and put Sturgill — the tying run — at second base. But from there, Morrow completely shut the door. With just one out, the junior struck out Chris Yerardi swinging and punched out Bryce Wallace looking to end the threat, then sandwiched three additional strikeouts in between a one-out single by Johnson in the bottom of the seventh to seal the deal on his complete game effort, and a Valley win. With the victory, Valley (1-1) will look to carry over its strong finish to Tuesday evening’s contest into a Wednesday evening battle with Waverly — a quality that Crabtree certainly believes can be done. As for Portsmouth (0-1), the Trojans will have to bounce back quickly — especially with Adena looming on Wednesday at the VA and Fairland following that affair on Friday evening in Portsmouth.